I’ve ranted here before about fast food and other restaurants these days that tout selling “healthy” food when in fact their offerings are still loaded with salt, fat and sugar. Some, like the Protein Bar, in Chicago are growing rapidly with these false health claims, basically pushing salt on unsuspecting patrons. So it’s nice to be able to write about one new chain in our area, the Naf Naf Grill, that actually has new, tasty variations on familiar foods using low-salt and low-fat recipes. A Naf Naf lunch once a week has become a special treat for me. The menu has Midwestern-inspired offerings, but Naf Naf makes its own low-salt pita bread and uses extremely lean beef and chicken for its pita sandwiches while keeping them tasty and filling! This past weekend I visited one of the chain’s original three locations in Niles, Ill., and tried something it doesn’t offer at its outlet on Chicago’s Michigan Avenue near my office, a chicken kabob sandwich in a pita. Including hummus and tahini sauce along with Jerusalem salad in the pita, the entire meal has only 10 grams of fat, 282 mgs of sodium and 2 grams of sugar. That is really amazing when you consider that a piece of traditional pita bread alone has about 300 mgs of sodium in it. Omit the tahini sauce and the meal is down to 8 grams of fat and 217 mgs of sodium. When I eat at the Michigan Avenue outlet or one in my suburb of Evanston, Ill., my go-to meal is a beef in a pita with Jerusalem salad and red cabbage. That selection has only 12 grams of fat, 211 mgs of sodium and 4 grams of sugar. I asked how they get such lean beef and was told the chain uses cheek meat to create the gyros-like loafs of beef it slices for the steak shawarma (the official name of what I order). 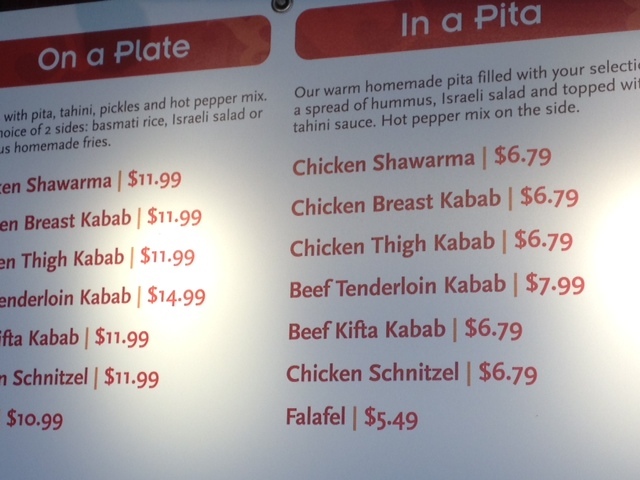 Oddly the chicken shawarma has a lot more fat than the beef because dark meat chicken is used. I now avoid that offering and wish they had the chicken breast kabob offering at more outlets. I often splurge with a second piece of pita which adds 3 grams of fat and gets the total sodium for the meal to 251 mgs. Thank you Naf Naf for finally giving me a choice for lunch besides salad. Keep working on getting the salt out of some of your other offerings like the rice and hummus sides so I can enjoy more of your delicious food.